I've been trying to eat better these last few months. I've put on quite a few pounds that I am not happy about, and in learning more about nutrition, I've learned to incorporate more Fiber, water, and natural ingredients into my food. One way to get it easily is by eating Kashi foods. 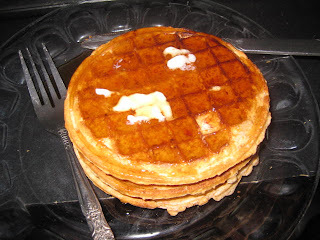 I recently received some coupons for the new GoLean Waffles by Kashi from VocalPoint. They provided me with one coupon for a free box, and coupons to pass on to friends. The other day I went to my local Giant grocery store and bought the Blueberry waffles. I made them a little while ago for a brunch-type of meal. Now I'm STUFFED to the hilts! I love every Kashi food that I have tried, which is ALOT! Their cereal, frozen food, and cereal bars are my favorites! Have you tried Kashi? If so, what did you try and did you like it? While you're at it, join VocalPoint to get other great things in the mail! I love Kashi so much. I think there TLC cheese crackers are better then any other cheese cracker I've ever had. Do you really like these? I have tried a couple of things by Kashi because I try to eat healthy as well but I did not like their cereal. Maybe it was the particular type I tried. I like waffles though so I might like this. I've been wondering if they were any good...I have my coupons right here beside me! The warm spring weather just motivates us to be fit!